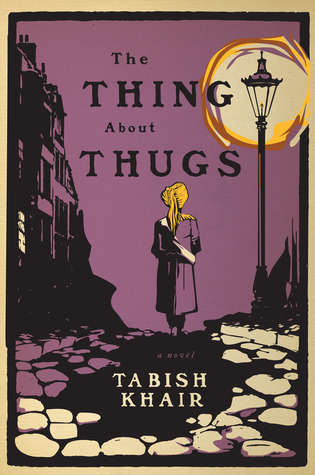 There are so many good aspects of Tabish Khair's The Thing About Thugs. It is a sort-of mystery set in Victorian London, which is always a fantastic setting for a mystery. It features a narrator with two narratives - one he tells an Englishman looking for a story about the Thugee cult, and one that is his real life story. There are body-snatchers hatching nefarious plots, wealthy lords obsessed with detailing the biological differences between the races to prove that whites are the best. Taking center stage in the second half of the story is a fascinating Indian immigrant woman who solves the mystery and brings things to a very satisfying conclusion without ever leaving her home. So many good things happening here! And yet. But let's start at the very beginning (a very good place to start). Amir Ali journeys to England with Captain Meadows after sharing a story about his life as a member of the famed Thugee cult. But we quickly learn that Amir's story is not so straight-forward. He used Captain Meadows just as much as Captain Meadows used him, to achieve his own ends. And when he comes to England, he has big plans to start a new life. But a series of brutal murders in which the victims are decapitated and left without their heads has shocked London and Ali, foreigner and former thug, is the prime suspect. Ali's life history is excellently related in this book. I really enjoyed learning about his actual life and just how it paralleled the life story he gave to Captain Meadows. I also thought Khair very accurately detailed what life would be like for a foreigner in Victorian London, especially for the poor ones. He made very clear just how xenophobic people could be and how quickly a mob mentality could form based on very little information. And Qui Hi, the woman who takes center stage at the end of the book, is a brilliantly created and utterly fascinating creature. She is worthy of her own book, and I think it's unfair that she has to make due with taking over the second half of this one. She's crafty, mysterious, and her currency is information. I so wish we knew more about her. But that's one of the ways in which this book fails - there are far too many characters, and way too many narrators. It's hard not to get lost in the plethora of perspectives. We have an omniscient present-day narrator who adds very little to the story at all. We have two different versions of Amir. We have John May the body snatcher. We have John May's wife. We have Qui Hy's husband. We have Major Grayper, the detective (who doesn't do much detecting at all). Captain Meadows. Captain Meadows' housekeeper. SO MANY PEOPLE, and while it's interesting to get so many perspectives, it dilutes the story. You expect all these narratives to come together in a puzzle-solving, totally illuminating manner at the end, but that doesn't happen, which is disappointing. And the ending - while I made peace with it and could understand why Khair did what he did - was also frustrating in that it made Ali's whole role in the book seem secondary. While Ali is the driving force of the first half of the book, he takes a backseat and becomes more of a spectator to his own life in the second half. And the one thing that he really wants to do and spends his energy doing... we never get to see the outcome. This is annoying. This looks amazing. I love mysteries set in Victorian times but it looks like Khair has found a new and interesting take on this. Yes, I think you'd really like this one! Awesome review -- I got this for review last year and never got around to reading it -- your comments reminded me I want to read it. I appreciate your thoughts! Ooh, I'll have to look for your review if you read it! I actually don't really think the title makes sense, after reading the story, but it certainly is catchy! I have only read one other review of this one, and it was pretty positive, as I recall. I liked this review because it was pragmatic and realistic, and I think that I would have a problem with that many characters as well. It sounds like an interesting book, but one that I might not take a chance on due to the problems that you had with it. Yes, I can completely understand that. I will look out for his next book, though, because Qui Hi was so cool. Multiple narrators can work, but a lot of them... I can see why it spoilt the story, especially if the main character gets "lost". I love the idea of both the story and "real story", though, that's pretty fun. Yes, it was very cool, though not explored as deeply as I would have liked. Hmmm: I'm not sure this one is for me (I have Issues with multiple narrators if they all have the same narrative sound, aka the author's tone) but you know I'm going to try it anyway. :p It's so challenging to find mystery series by POC authors! Using many narrators is always a popular pitfall, especially if the author cannot give a distinct voice to all of them. Love the cover though! I brought this one home from the library, but with the holidays, I never even opened it and had to return it. I may give it another try, just because I love the title! I kinda want to read it even though it has flaws - sounds just intriguing enough. After reading your thoughts on this book, I can see why and how it felt short for you.